Japanese artist Chiharu Shiota is known for monumental installations of yarn, threaded through the room like splashing paint in the air. One giant red woven web currently covers the ceiling and walls of Gallery Blain Southern’s Berlin dependance, reaching towards skeletal hulls of boats on the floor. “The installation is like one vast network, with the boats carrying us through on a journey of uncertainty and wonder” Shiota created the installation called ‘Uncertain Journey‘ with the idea of the journey of life which has no concrete destination. “The installation is like one vast network, with the boats carrying us through on a journey of uncertainty and wonder.”, says Shiota. 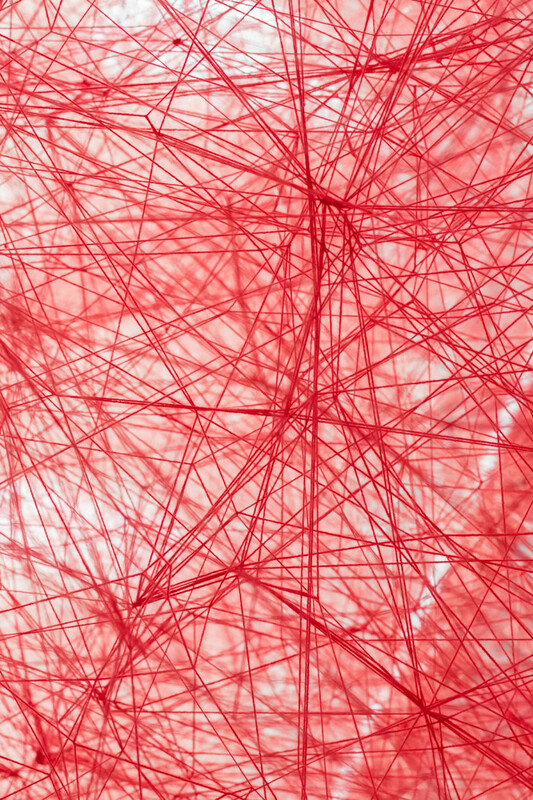 The dazzling red of the yarn symbolizes our blood, the web structure relates to veins and nerve cords and even to the connections between people, our changing relationships. Artist Chiharu Shiota was born in Osaka, Japan and lives, and works in Berlin. She represented Japan at the Venice Biennale in 2015.